A war is being waged in my Zazzle stores. 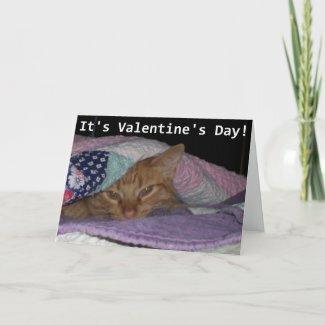 Two sides of my multi-faceted feline child, Bart, are battling for supremacy in the form of two different Valentine's Day cards. The first card represents Bart's sweet and cuddly aspect - also known as Snuggle Cat. 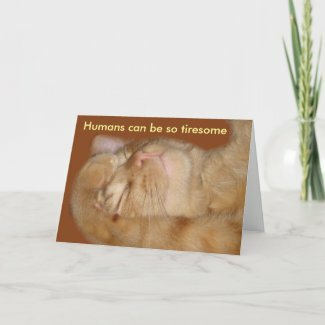 While the second card is more aligned to Bart's attitude when he is not among blankets or people who worship him - we call him Sarcastic Cat. So far, the popularity of these cards has been relatively even but if I had to give an edge to one, it would be to Sarcastic Cat. While The Snuggle Cat Card has more votes, The Sarcastic Cat Card has had more sales recently. I'm not sure if I should be disturbed by this trend or not. I love all of Barty's personalities (with the possible exception of the one that scratches woodwork) but I have to admit that Snuggle Cat is my favorite. So what do you think? Snuggle Cat or Sarcastic Cat? Leave me a comment or click on the cards below and cast a vote for your favorite just beneath the picture on the product page. I'll let you know which one emerges victorious after Valentine's Day.